As we traveled through Dayton, Ohio we saw many places where construction was taking place, causing confusion and traffic delays. Many factories have been closed and the broken windows are scars on the landscape. Some areas of the city seem to be completely laid waste. On one road we traveled, we saw apartment building after apartment building deserted. We also saw many once-grand homes now boarded shut and the streets deteriorating. Why? Like many cities in the industrial belt, it has happened mostly because of the decline of manufacturing in this country. Dayton is recovering, through its new industries of health care, technology, and of course, aviation. But many areas remain deserted or sadly deteriorating. 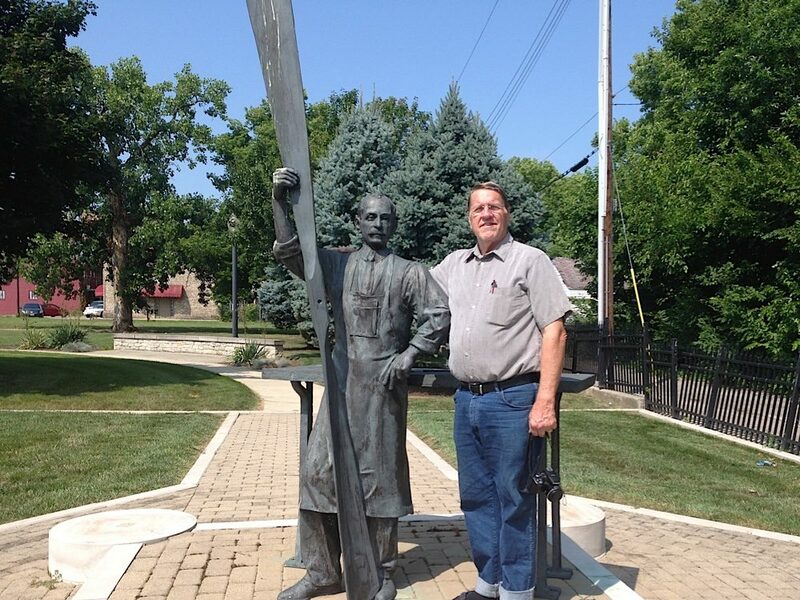 Art stands next to Orville Wright as he displays his propeller. Orville is just the right height, don’t you think? But in one small area of Dayton, we saw an attempt to rejuvenate a forgotten area. The National Park Service is helping to bring restoration to a neighborhood that could have easily been bulldozed to start again. But then a long-forgotten photo, taken in the early part of the 1900s, was recently found in the basement of a city residence. It pictures a lady sitting in a chair alongside the street. In the background is a building that has the name “Wright Brothers Cycle Shop” written on it. The discovery of one of the five locations where the Wright Brothers had once sold bicycles was something that caught the attention of the NPS and began the process of saving the old building and rejuvenating the neighborhood. 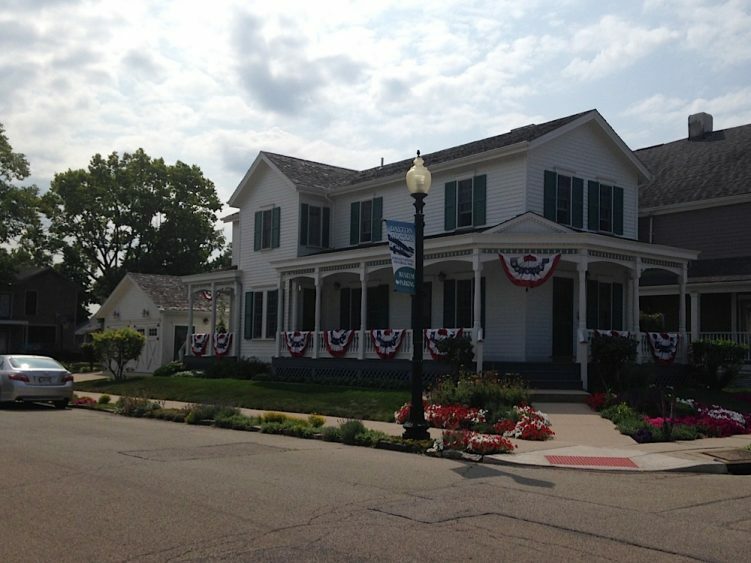 A historical museum has been built on property adjoining the old Wright Brothers shop and a program to help people buy and renovate the surrounding homes has made it possible to renew the area and save several historic homes from the bulldozer. The museum has much to offer in the way of information on the Wright brothers and their important discoveries concerning flight. The sites of the original bicycle shop and Wright home are empty. Henry Ford purchased and moved the buildings to Greenfield Village in Detroit, Michigan. 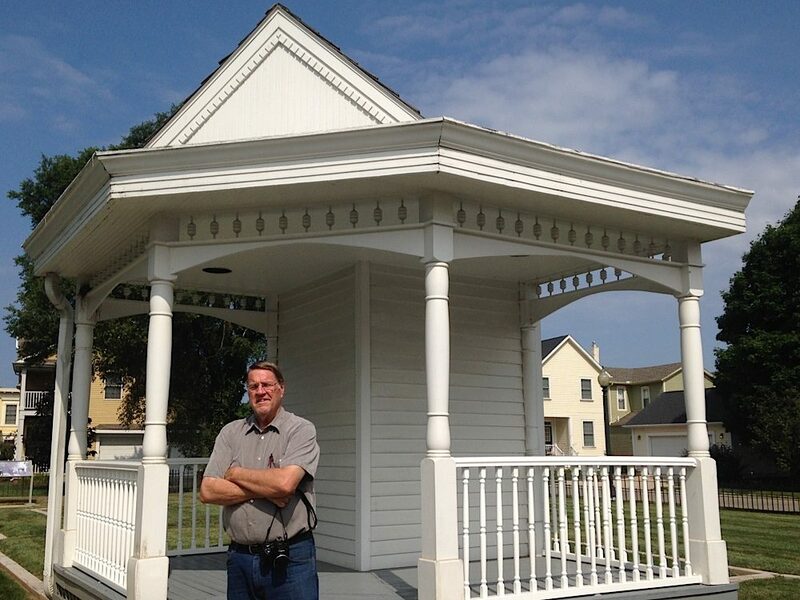 The site of the Wright home is an empty lot with just a replica of the original front porch (Which Wilbur and Orville built) standing on the corner. That porch was erected to show where the building once stood. We met Ernie as we were crossing the street and heading back to the Park Service museum. He was sitting on his porch and called out to us with a friendly “Hello!” We responded and soon were engaged in conversation. Ernie asked if we’d like a tour of the house and we, of course, said, “Certainly!” There was no charge for the tour and he was delighted to be able to show us through the house. Since acquiring the house, Ernie has commissioned and collected many pieces of artwork depicting the work of the Wright brothers. He explained all of them to us as we toured his home. It was very exciting to us to have this opportunity, and when we questioned him as to his willingness to show the house to readers of our blog, he quickly agreed. So, when you get to Dayton and visit the Wright Museum, be sure to see if Ernie is home and ask him for a tour.